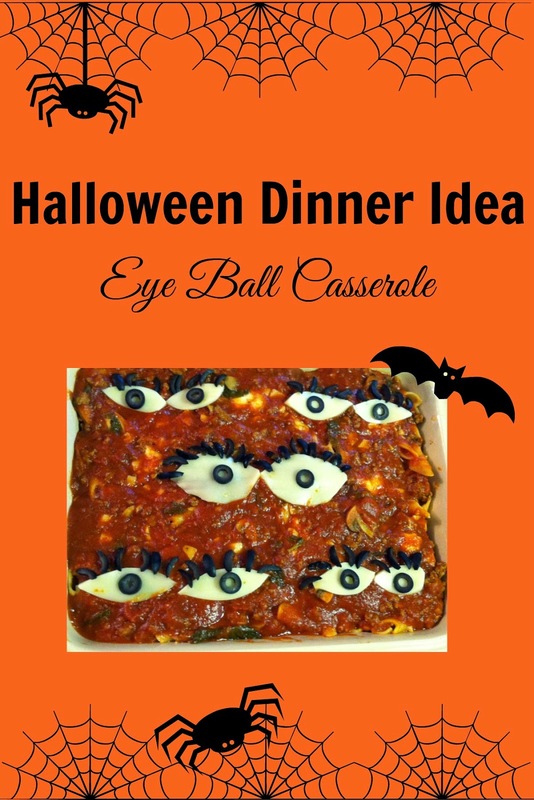 Eyeball casserole is my favorite Halloween tradition. I started making it 3 years ago and I can't imagine Halloween without it. When my kids were little they didn't remember eating the casserole the previous year so I could trick them into thinking we were eating real eyeballs for dinner. Sadly those days are behind me. This dish is still going to be served every year for dinner on Halloween. It's fun and unlike so many other cutesy dishes, it doesn't take very long to make. It's baked ziti with a little embellishment. I make a huge batch of meat sauce that I use for this meal and freeze the rest for many meals in the future. You could easily make it vegetarian by omitting the meat or use jarred sauce. It's your dinner, make it the way that works for your family. The best part about this dish is that it can be made in advance. I make it the day before or in the morning while my kids are at school. Halloween is hectic enough, I don't need the added stress of cooking dinner in the evening. All I have to do is pop it into the oven and I'm sending my kids out to trick or treat with full tummies. It's important that they have enough endurance to collect enough candy to cover the parent candy tax. This is just about the most kid friendly meal I make. My kids think it looks cool and pasta is always a hit in my house. 1. Cook pasta to al dente according to package directions. Drain and return to the pot. 2. While the pasta is cooking, beat the eggs in a medium sized bowl. Stir in the ricotta and Parmesan cheese, and salt and pepper. Cut 10 slices of mozzarella cheese. Cut your cheese slices to look like eyes and set aside. Shred the remaining mozzarella cheese and stir it into the egg mixture. I like to throw in the scrapes of cheese from making the eyeballs. 3. Pour half the noodles into a 9x13 pan. Using half of the cheese mixture drop small spoonfuls of cheese over the noodles. Top with 2 1/2 cups of sauce. Repeat the layers of noodles, cheese, and sauce once. 4. To make the eyeballs slice the olives into circles. You'll need 3-4 olives to make the eyes. To make the lashes, cut the olives length wise into small strips. 5. Place the mozzarella eyes in any pattern that looks great to you. Place the olive rings in the middle of the cheese slices and use the olive strips to make lashes. 6. Cover the dish with aluminum foil and bake in a 350 degree over for 40 minutes. Easy dinner idea that the kids will actually eat! It's a fun Halloween tradition in my house. Do you have any Halloween traditions? This looks too cute. I think although it wouldn't trick my kiddo that she'd enjoy it anyway. :) Plus, pasta and sauce and cheese? Yum! Thanks! It's sad when our kids can't be tricked anymore. This looks so cute, I am going to have to make it this Halloween. My kids love baked ziti. Pinned it so I don't forget to make it! It's such a fun dish to make. I love that it's fun but it doesn't take hours to assemble to make unlike so many kid dishes.